This is a sample of what a typical lecture page looks like. We've made it accessible so that you can get an idea of whether or not this format makes sense for you. Take some time to read through the material and watch the videos. This page focuses on understanding the pathophysiology, assessment, and treatment of lightning injuries. The material on this page is summarized for field use on pages 54-55 of the Wilderness Medicine Handbook. Thunderstorms and lightning are created when water molecules within the rising warm air become ionized (negatively charged) as they enter the cooler air in the upper atmosphere. Between 5 and 10 kilometers negatively charged water vapor condenses and turns to water droplets and ice crystals. When heavy enough to overcome the updraft, the droplets or crystals fall as rain or hail, bringing the cooler air and their negative charges with them. As negative charges accumulate at the bottom of the cloud, a step leader shoots at 150-foot (45.7-meter) intervals toward the ground. Because like charges repel one another, the negative charges at the bottom of the cloud force the electrons in all objects below the cloud deep into the ground, leaving positive charges to accumulate directly below the cloud. As the positive charges increase in strength, they create electron streams known as "dart leaders," which move upward towards the cloud and connect with the negative step leader moving down to complete the circuit. This initial upward stroke is followed by a massive return stroke. Thunder is the result of super-heated air abruptly expanding outward from the completed circuit. The process continues until the charges are equalized. A single lightning bolt is really a series of sequential strokes one immediately after the other. The multiple strokes are responsible for the characteristic flickering and branching. Mountainous regions with cool nights and hot days. Mountain storms tend to develop during the hottest part of the summer. Falling cool air from the high mountains feeds developing storms as it dives under the warm air at lower elevations pushing it upward. Local lakes increase the moisture content of the system and the severity of the storms. A cold front moving in under an existing warm air mass forces warm air upward causing lines of thunder storms to form behind it. Dark land masses surrounded (or partially surrounded) by cooler water. Water retains its relative coolness from the winter due to its tremendous mass. The darker land heats up in the hot summer sun and heats the air close to the ground causing it to rise and form thunderstorms. Direct Hit: As the lightning travels down the tree, the sap changes from a liquid to a gas and the tree explodes, splits, or scars. The expanding air and/or involuntary muscular contractions caused by the electrical current can throw a victim many, many feet. Side-arc or Splash: Current travels down the tree and jumps or arcs into the person standing close to the tree trunk. Ground Current: Current travels down the tree, through the ground and into the victim. Conducted Current: Current travels along a wire fence (or shroud) and into the victim. Regardless of the type of strike—direct hit, splash, ground current, or conduction—the primary electrical pathway in the human body is peripheral and flashes over the victim’s skin, turning water (sweat/rain) to steam and creating linear thermal burns, tearing holes in clothes and blowing shoes off. In rare cases it can ignite sections of the victim’s clothing and cause thermal burns. Nerves often conduct the current deeper into the victim’s body, disrupting cardiac, respiratory, muscular, and nervous system function. Death is possible (± 20%) secondary to cardiac arrest (asystole versus ventricular fibrillation), respiratory arrest (paralysis of respiratory center), or delayed multi-systems failure. Some form of long-term physical and/or psychological disability is common among survivors. It's important to remember that blunt injury from strong involuntary muscle contraction stimulated by the lightning and/or the rapid expansion of air near the strike site (thunder) often causes the victim to be thrown many feet. Traumatic injuries are likely and can be ruled out in the normal fashion. Both respiratory and cardiac arrest are possible. If a lightning victim is awake, they will usually remain awake. Assume any person with a severely altered mental status in the vicinity of a lightning storm to have been struck by lightning. 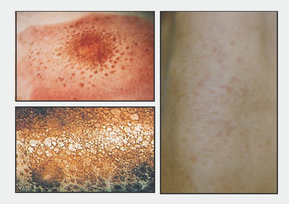 Fern-like patterns on patient’s skin indicate a positive lightning strike. Traumatic injuries are likely. Assume that all lightning victims have an unstable spine; spinal cord damage is possible. Assess and rule out traumatic injuries normally. Temporary paralysis, numbness, and weakness are common. If patient’s clothes have been blown off, check for superficial linear burns. Small entry/exit wounds at conduction/contact points are common. Patient may present with punctate burns along the current pathway. Patient may have thermal burns from contact with metal or plastic. Ruptured ear drums are common due to the sound- and pressure waves created by rapidly expanding air; patients may be disoriented and temporarily deaf with vertigo and tinnitus. Patients may be temporarily blind with corneal damage and/or develop cataracts at a later date. General confusion, headaches, amnesia, and exhaustion are common and may persist for several days or weeks. Permanent personality changes, including irritability and depression may occur. Patients may present with cardiac dysfunction and arrhythmias or they may develop over time. Pulmonary edema is possible but rare. Know the local weather patterns. Seek shelter when you hear thunder. Stay away from high, exposed places. Stay away from open areas. Do not take shelter directly under trees. Remove all metal from contact with your body. Seek shelter in dry areas not exposed to the storm’s rain shadow and insulate yourself from the ground. If woken by thunder at night while in a tent, get up and squat on your sleeping pad until the storm passes. Avoid shallow caves, gullies and overhangs. Caves should be dry and at least 2-4x your height in length. Avoid holding onto metal fences, wires, or shrouds. Move if your hair stands on end, you see or hear static electricity, or you see a blue ring around objects—a strike is imminent. If caught in a strike zone, move in an organized fashion toward a safe area. Immediately begin CPR if patient is in cardiac arrest. Recovery with CPR is possible. Continue PPV if respirations are absent and pulse is present. It is common for lightning patients to require ventilations for hours before they are able to resume breathing on their own. Support the patient’s spine and rule out a spine injury as the situation warrants. Treat all linear and punctate burns as partial or full-thickness (rare) thermal burns. Rule out and treat all traumatic injuries as usual. Ruptured ear drums tend to heal on their own within 2-3 weeks. DO NOT FLUSH. Avoid getting water in the ear (swimming, showering, etc.) until healed. Have drum visually inspected before swimming. Fern-like patterns are temporary and will disappear in 24-48 hours. Evacuate at Level 3: Patients who are awake with no loss of consciousness, a normal physical exam and are asymptomatic. Evacuate at Level 2: Patients who are awake with an altered mental status and minor S/Sx. Evacuate at Level 1: Patients who have suffered cardiac arrest, respiratory arrest, or who are currently V, P, or U with Advanced Life Support to a major trauma center.